I don’t actually have five, but I do have one ring. But not The One Ring, I promise. 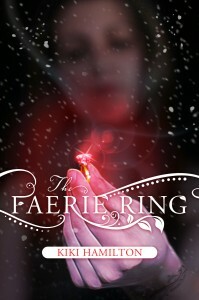 It’s The Faerie Ring by Kiki Hamilton. The year is 1871, and Tiki has been making a home for herself and her family of orphans in a deserted hideaway adjoining Charing Cross Station in central London. They survive by picking pockets. One December night, Tiki steals a ring and sets off a chain of events that could lead to all-out war with the Fey. For the ring belongs to Queen Victoria, and it binds the rulers of England and the realm of Faerie to peace. With the ring missing, a rebel group of faeries hopes to break the treaty with dark magic and blood—Tiki’s blood. Prince, pauper, and thief—all must work together to secure the treaty…. Kiki followed The Fairie Ring with three more books in the series, and I invite you to check them out. Enter below to start reading this awesome Victorian fairy story! Nice! I love historical stuff! Tiki – what a fun name! This sounds so fun! I love the combination of historical fiction and faeries! Victorian + faeries? I’m intrigued, and would love to win. Thanks for running these giveaways! this has been on my radar for awhile. Th his sounds super good. It’s on my wishlist on Amazon. Congrats! You won! Will send you an email.